It’s that time of year again. The new time of year. We look back, we look forward, and we look at where we are. We start sentences with, ‘This time last year…’ and see how far we’ve come. I stumbled across a wishing tree soon after moving to Vancouver, and it stopped me in my tracks. It was fascinating and often heart-rending to look at the hopes people had hung there for anyone to read. In a way, when we look forward to a new year, it’s like decorating a fresh wishing tree with longing for the fruit we’d like it to bear. We reflect on our lives and revise our plans. We dream. But for our trees to flourish and our dreams to come to fruition, we need to do more than plant them, more than just write them down. We need to nurture them. We need to give them life, light and room to grow. When I look back on last year, I came a pretty long way in terms of distance, but not in terms of dreams. While business smiled upon me and adventures were around every corner, I didn’t write as much as I wanted. And that was no one’s fault but my own. However, I have to let that go now. That’s last year’s tree. I didn’t water it enough. But I can change that this year. And it’s not like I have lost anything. The time wasn’t wasted. I lived so much life last year, saw so many new places, experienced so many incredible things. Took so many pictures. I’ve heard those actually say a thousand words, and if that’s the case, perhaps I can claim I actually wrote a hell of a lot, just not in the way I envisioned. But, like I said, that’s last year. Let’s look at where I am. Am I happy? Yes. Am I further than I was? Yes. Am I free to move forward? Yes. So that’s a start. What of the year to come? I want to continue to immerse myself in beautiful places, in discovery, adventure and nature, but I need to find more words to go with the pictures. I need to find my voice again. I want my writing to thrive, wherever I’m living, whatever I’m doing. I’ll keep snapping, appreciating every remarkable moment in time, but I want to move on with things as well as around places. I want to leave more of myself for someone to pick up and read. My published works consist of an only child at the moment, and that was never the plan. So this is the year I pull my trilogy together and climb my wishing tree, reaching the hopes and dreams hanging from its branches. Because I bet the view from the top is spectacular. What are your resolutions? Can you let go of last year and nurture your dreams? 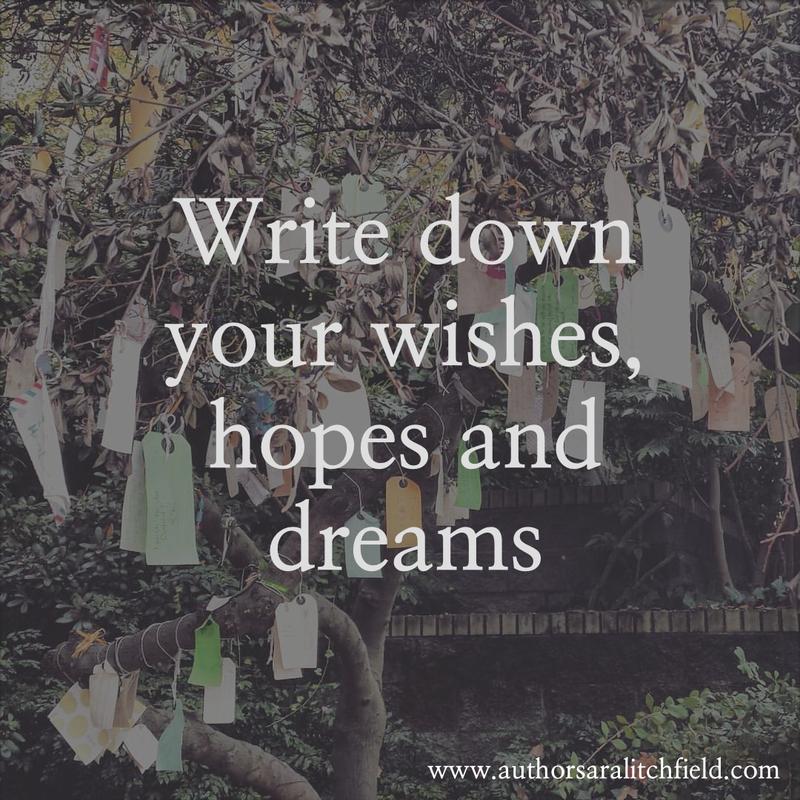 This entry was posted in On Hope, On Where I've Come From & Where I'm Going and tagged 2017, author, dreams, editor, hopes, make the right mark, new year, new year's resolutions, photographer, right ink on the wall, sara litchfield, wishes, wishing tree, writer on January 6, 2017 by Sara Litchfield.